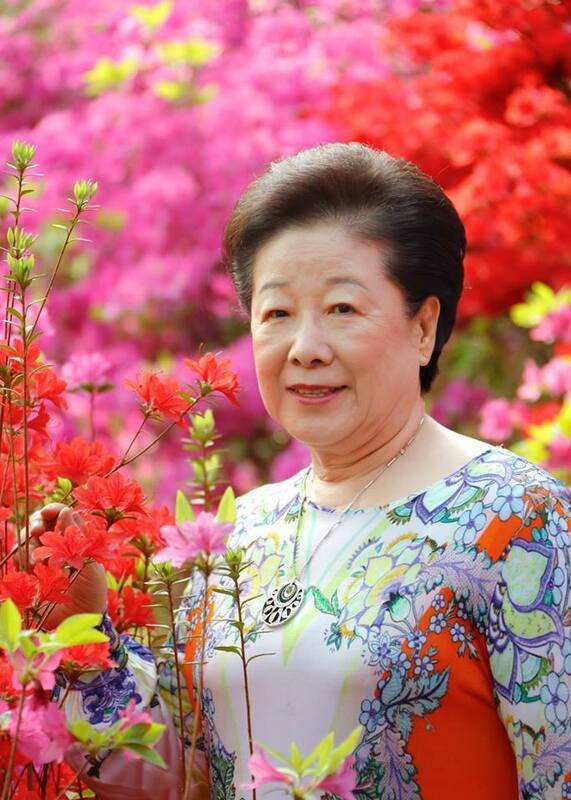 True Mother, Hak Ja Han, was born on the sixth day of the first lunar-calendar month in 1943 (February 10 by the Gregorian calendar) at 4:30 AM, in her mother's family home in the town of Anju, in Anju County, South Pyongan Province, in what is today the Democratic People's Republic of Korea. Her birth came ten years after Mr. Seung Woon Han and Ms. Soon Ae Hong had met and married in the New Jesus Church. She was her parents' only child. Her mother's family home had a small hill behind it and a brook running nearby. True Mother looked back on her mother's home as a place that gave her a feeling of comfort and warmth. "It felt like the bosom of a hen nurturing her young. In the back garden, they grew a crop of corn for the family and the corn plants were very tall," she remembered. The origin of Seung Woon Han's family line is Cheongju in North Chungcheong Province. True Father said that "chungcheong" signified that "the center of the mind is pure," and that "cheongju" meant "clear village," referring to a village where enlightened men dwell. The Cheongju Han clan is therefore a family whose members' purpose in life is to attain enlightenment by achieving purity of the center of their minds. True Mother's father, Seung Woon Han, was born on January 20, 1909 in the village of Yongheung in Anju County, South Pyongan Province, as the oldest son of five children born to Byeong Geon Han and Gi Byeong Choi. He was studious in his school days, and from early on he determined to become a teacher. After qualifying as an elementary school teacher, he taught in schools for forty-one years. He was also a devoutly religious man. True Mother once explained, "My father was a devout believer of the New Jesus Church. Following Rev. Yong Do Lee and Rev. Ho Bin Lee, he practiced his life of faith together with Soon Ae Hong." From the beginning time of the New Jesus Church, founded by Rev. Yong Do Lee, Seung Woon Han devoted himself to the work of the church as one of its principal members. Soon Ae Hong was born on February 22, 1914, in Jongju, North Pyongan Province, as the older of two children, one girl and one boy, born to Mr. Yu-il Hong and Mrs. Won Mo Cho, who were devout Christians. Yu-il Hong, True Mother's grandfather on her mother's side, was a tall, kind-hearted and handsome man. He was also knowledgeable and open-minded, and a scholar of Chinese classics. True Mother reminisced that, when she first met True Father, his looks and general features reminded her of her grandfather, so she had not felt unfamiliar or awkward. 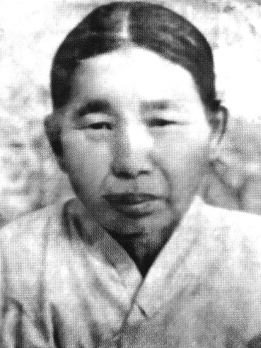 True Mother's grandmother on her mother's side, Won Mo Cho, was a woman of the modern age. Small in stature, with a pretty face, she had an active and assiduous character. In particular, she was sensitive to the changes of the times to such an extent that at the time of March 1st Demonstration for Independence in 1919, she joined the ranks of people shouting Mansei, carrying her then five-year old daughter Soon Ae on her back. Moreover, she was a devout Christian and greatly influenced Soon Ae in her religious beliefs. At the time she gave birth to Soon-ac, she had been an active member of the Presbyterian Church. Soon Ae's name was given by her minister. When she was young, Soon Ae graduated from Anju Elementary School, and in April of 1936 she graduated from Pyongyang Seongdo Academy. She remained a member of the Presbyterian lurch until age 19. Since my family was Christian, we did not worship our ancestors and so I don't know how many generations back this story dates, but I've been told that it was around the time Korea was in a subordinate relationship to China. When an envoy of China wished to come to Korea, he needed to cross the Dalae River in Jongju, but at the time there was no bridge over that river, because the state was too poor to build one. Therefore, the state put up a notice to find someone who could build a bridge. At the time, an elder of the family named Han-joon Cho built the bridge, with money from his own pocket. The bridge was built of stone and so big that boats could pass under it. The elder Cho spent all his wealth on the bridge, and in the end all he had left were three brass coins. He was scheduled to attend the bridge dedication ceremony and so he bought a pair of straw shoes with the remaining money and went to sleep. Then, in his dream, an old man dressed in white appeared and said, "Han-joon, you have done a remarkable deed. Heaven had planned to send the Son of Heaven to your clan, but the remaining three brass coins are weighing on our mind, and so we will send a princess instead." True Mother was born at a time when Soon Ae Hong was still following Seong Do Kim, travelling to and from Cheolsan. Her father, Mr. Seung Woon Han, saw a vision and chose True Mother's name himself. "I was told," Mother said, "that when I was born, my father had something like a dream, more like a vision. A clear and beautiful ray of sunlight shone through a dense forest of green pine trees, and in that light he saw two cranes playing together. That's why he named me "Hak Ja." True Father said that the name, Hak Ja Han, has providential significance, in that it means "to become a scholar who has studied more than anyone else about the grieving God (God of han), and to go to God as His object partner." In particular, he explained that the Chinese character for "ja" meaning "son" in the name Hak Ja indicates that "she is meant to form ties with the Son of God," and that "she was destined from birth to form a connection with God's prince." True Mother's mother remembered, "Other babies cry, Waa, waa, waa! when they born, but when Mother was born, she did not cry; she said, Lala lala." And her grandmother said, 'I think this girl will grow up to be a musician." Satan threatened True Mother immediately after she was born. Her mother had had her first bowl of seaweed soup'° and had fallen asleep. Satan, with black horns, approached the baby and with the intention of harming her, saying, "If I let this girl be, the world will be at risk in the future; therefore she should be killed now." Soon Ae Hong, however, boldly embraced the baby. She shouted, "Satan, go away! This girl is my precious daughter; who are you to come to try to kill her?" Engaging in a fierce spiritual fight, Soon Ae Hong continued to shout in a loud voice until her mother came running. She was astonished to hear what had happened. Soon-ac Hong also wondered, "Why does Satan want to kill this baby?" and resolved in her heart, "I will raise her to become a pure and beautiful girl untainted by the secular world." Sometime later, she had a dream in which Seong Do Kim appeared wearing white clothes and riding a white cloud. Kim spoke to her, "Don't worry. This baby is the daughter of the Lord and you are her wet nurse. You should raise her well, bearing in mind that you are doing so in God's stead. Feed her well and nurture her." After receiving this spiritual revelation, Soon Ae Hong lived her whole life cherishing the belief in her mind that she should raise True Mother well as the daughter of the Lord. A little while after True Mother's birth, Seong Do Kim -- known as the New Lord -- of the Seongju [Holy Lord] Church, was arrested and tortured. In the aftermath of the torture, she died. Mother's mother began her life of faith anew in the "Inside the Belly Church." Afterward, when Ho Bin Heo was imprisoned, Ho Bin Heo's mother received a revelation and continued to lead the Inside the Belly Church. In the year True Mother turned four, Ho Bin Heo's mother, wearing white Hanbok, blessed her with the words, "She is destined to become the bride of Heaven." Thus, the foundation of devotion to receive the Lord at his Second Coming was passed on to True Mother. True Mother recollected the situation of the time, saying„ "When I was not quite six years old, [Mrs. Heo] prophesied, 'She is the one destined to become the bride of Heaven.' She had continued to receive the revelation that a young girl not yet six years of age was born with the destiny of becoming Heaven's bride." Though she had been quite young at the time, that moment is still fresh in True Mother's memory. "Following in the footsteps of the Holy Lord Church," Mother added, "Ho Bin Heo's group was an organization entrusted with the mission of the bride of the Lord at his Second Coming. Based on this she pronounced a benediction on me. Having received the prayer that I was the one destined to fulfill a great mission in the future, a not-so-old grandmother wearing a white jogori called me and blessed me, saying that she had received the revelation from Heaven. I remember this all vividly." True Father said, "Grandmother Hong has followed a historic path of suffering to receive the Lord, carrying nothing but a packed bundle, leaving everything and everyone behind her, to follow the way of her faith. This is why Mother has also been trained to do the same. That's the easiest way, isn't it? If this is the path the husband has to follow to work zealously for the providence, he needs someone from a family that will wish him to work even more zealously. With this thought in mind, I chose Mother." 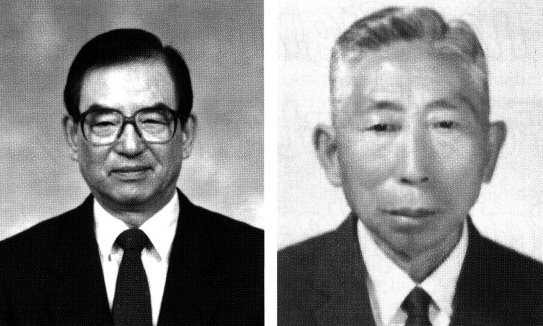 Left: Soon Jeong Hong, Soon Ae Hong's brother, who helped his sister and niece in their early days in South Korea Right: Seong Do Kim's oldest son Seok Cheon Chung who introduced Soon Ae Hong to True Father in 1955; his son, Su-won Chung, was blessed among the 36 couples. After Soon Ae Hong's only sibling, her younger brother Soon Jeong Hong, had graduated from school in Pyongyang, he began studying in Japan. From around 1940, he was away from home. Therefore, Soon Ae's parents wanted their son-in-law, Seung Woon Han, to live with them after his marriage to their daughter. Seung Woon Han, however, was the oldest son in his family and did not desire to live as a man adopted into his wife's family. Also, he was working as a teacher in Yeonbaek, Hwanghae Province, so he could not have lived with them even if he had wanted to. Under the circumstances that True Mother had been born in her mother's family home, her maternal relatives protected, raised and nurtured her in her faith. Grandmother Hong's parents did not wish for True Mother to be raised in Seung Woon Han's household. The situation changed in 1946, when Seung Woon Han had to flee south to escape from a threat from communist authorities. He resolved to go south, and he went to his wife's home to take her and True Mother with him. Mr. Han implored his wife to travel south with him. At the time, however, Soon Ae Hong was offering devotions in preparation, at the Inside the Belly Church, for the Second Coming of the Lord, and she felt unable to abandon the path of her faith to go with her husband. After this, True Mother never met her father again. Seung Woon Han remarried the following year, and he repeatedly told his oldest son from his second marriage, Wee Il Han, that he had left a daughter behind in North Korea and that when the country was reunited he should go to look for his older sister. My maternal grandmother, Won Mo Cho, and my mother led lives of consistently making preparations and practicing their faith in order to receive the Lord at his Second Coming. They never made compromises with the world. Rather than practicing their faith in the conventional way, without impinging on the comfort of their domestic lives, they served heaven twenty-four hours a day and devoted themselves to preparing to receive the coming Lord. My mother's life of faith was such that she was usually away from home, so when I was young I spent most of my time with my grandmother. Through Grandmother Cho, I came to accept faith as a natural matter of course. "Therefore, when I heard the word 'father,' I did not think of my natural father. Instead I thought of our Heavenly Father. That was why the thought of God always gave me a feeling of comfort and warmth. Though I grew up in an environment that those looking from the outside might find difficult to understand, I did not feel dissatisfied or discontented. I always felt snug, as if someone were constantly embracing me. I always felt composed. I never questioned my mother or my grandmother about my natural father, or why the two of them lived the way they did. I was contented with my life. In my whole life I never harbored feelings of resentment or rebelliousness against my natural parents." True Mother as a young child. This photograph was probably taken around the end of the Korean War. Communist religious oppression mounted as time passed. In 1948, Grandmother Cho and Soon Ae Hong spent eleven days in prison. At the time, True Mother was pretty and courteous despite her very young age, so even the communist authorities treated her kindly. During that time, Grandmother Cho received a revelation to go to South Korea to find the Lord. She tried to prevail on Soon Ae to go with her. Her father also advised her to go with her mother. Mother's mother, however, was troubled over the situation of Ho Bin Heo, who was still in prison. She was reluctant to go south, saying), "She is still in prison; how can we just leave?" Grandmother Cho continued to try to persuade her to travel to South Korea, saying that if she stayed, she would end up dead. Soon Ae Hong still hesitated and agonized over the matter, but in the end she decided to go. Walking down the road with their backs to Pyongyang, they could not speak. Their hearts were breaking. Added to this, Mother's grandfather, Yu Il Hong, remained behind so the family would not incur suspicion. In fact, this turned out to be a final parting; they never saw him again. South Korea was a strange place for all three, Grandmother Cho, Soon Ae Hong and the young Hak Ja Han. They had never been to Seoul, but Soon Ae Hong's younger brother (True Mother's uncle) Soon Jeong, who had been studying in Japan, had returned to Korea in the middle of his studies when the Second World War broke out and had begun working at a Seoul chemical research laboratory. Eventually, he had finished his studies at the Seoul Pharmaceutical School, and after being trained as a pharmaceutical officer in the Korea Military Academy, he served in the military as a first lieutenant. The three women had come south in the hope of meeting up with Soon Jeong Hong, but because he was serving in the army, they could not meet him right away. Therefore, having heard the news that the oldest son of Seong Do Kim of the Holy Lord Church in Cheolsan had come to South Korea before them, they made a plan to go to see him first. True Mother's memory from that time differs a little from the testimony of her mother. True Mother said, as she recalled that moment in time, "My uncle on my mother's side was in the army. My grandmother missed him so much that we three, my grandmother, my mother and I, came to South Korea just for a visit, but we were forced to stay in South Korea from then on. My uncle wanted to go to North Korea, but the circumstances did not permit it, and he couldn't go." Several days after they had left their home, they crossed the Thirty-Eighth Parallel with great difficulty. 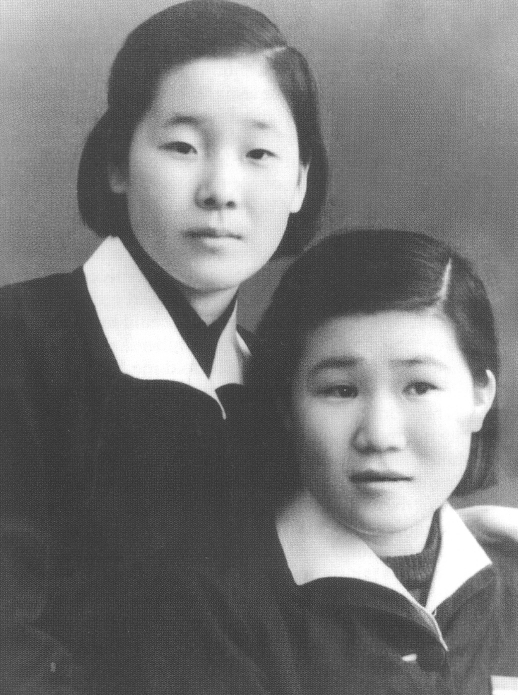 As soon as they had crossed, True Mother said, "We don't have to sing songs praising Kim Il Sung anymore, do we? I will sing a South Korean song," and all of a sudden she started to sing. At that moment some South Korean soldiers, having heard the sounds of people approaching from the north, raised their weapons. But when the soldiers heard the song they lowered their guns once more and warmly welcomed the party. One soldier said, "You must have gone through so much trouble to bring such a beautiful daughter with you," and unexpectedly gave them enough money to pay for their way to Seoul. As can be seen, though they encountered many difficulties on their way south, God was watching over them. With the hope of meeting the Lord, they offered bows and prayers on the road. True Mother had been participating in the bowing rites of the Inside the Belly Church since the age of three, so she bowed with them. Upon arriving in Seoul, they prayed, How can we find Soon Jeong Hong? Then seemingly by chance they met one of his friends near the main road. The friend guided them right to the army headquarters in the Yongsan district, where Soon Jeong Hong was working at the time. He immediately sent out his staff sergeant to find a room in Hyochang Dong for them, and had them stay there. Thanks to the foundation they had laid through the devotions they had made with prayers and bows, they had been able to meet Soon Jeong Hong and find a place to live in Seoul without much difficulty. Meanwhile, True Mother entered Hyochang Elementary School. It was not long afterward that the Korean War broke out. Even during the war, God watched over True Mother's family. As soon as the war began, her uncle Soon Jeong Hong came to bring True Mother away. Having received the intelligence that the Han River Bridge was going to be blown up, he had hastily driven over in his three-quarter-ton army truck, and they left at once. As soon as they had crossed the bridge, her uncle urged his family members to get out of the vehicle, and when they had all gotten out and thrown themselves flat on the ground, the bridge blew up. True Mother has given a detailed account of the situation. At the time, many civilians and soldiers who were crossing the bridge fell into the river and drowned, but thanks to my uncle, we were fortunate enough to escape with our lives. Most Korean people of my age have gone through the war and a period of suffering, but Heaven always watched over me and protected me. I was able to live through it all without incident. During the Korean War, I was unharmed. "While we were fleeing south, I caught a cold. My mother gave me taffy to eat so I wouldn't cough. And when I cut myself, she treated the injury by mashing cactus and rice together and placing the mixture on it, which drained the wound." Later, Soon Ae Hong and family stayed in the military family relocation camp in Jeolla Province, and after Seoul was reclaimed on September 28, they returned to Seoul and stayed in an empty house. Then, the January 4 retreat forced them to flee south once again. Soldiers' families were allowed to get on a special train before other refugees, and they left Seoul on the train and went to Daegu. At the time, the army headquarters was in Daegu, so they lived in the vicinity of the home of Mother's uncle, who was working there. They also met the family of Seok Cheon Jeong, who had been living in the city of Daegu for a while. He was the oldest son of Seong Do Kim, the New Lord of Seongju Church, and at the time, he was in the petroleum business in Daegu. Before Korea had gained independence, when Seong Do Kim died after being in prison, he had liquefied a part of his inheritance, and in 1944 had invested in the Chilgok Mine in North Gyeongsang Province. This, in turn, had led to his settling down in Daegu. After the first joyful meeting of the two families, Soon Ae Hong said, "When we were living in North Korea we received many blessings through the New Lord Seongdo Kim and Mrs. Ho Bin Heo, and great miracles occurred. Since the Second Coming of the Lord is to occur in Korea, let us pool our efforts and pray together to find this path." So they lived for four years with Seok Cheon Jeong's family in Daegu, with one heart. I felt that it was my responsibility to put Mother through elementary school at the least, so I began a small business in Daegu. I lived solely on kimchi soup, pine needles and peanuts, eating only twice a day at that, and though I felt a little weak while working, my mind was all the clearer. My mother came to see me and she told me, 'You have gone insane. How can you do business eating nothing but that? It is a miracle.' I felt at ease in my mind, however. I continued working thus for three months. Having been a believer of the Seongju Church and the Inside the Belly Church, all I knew was to have unconditional faith. True Mother (here, standing, in her middle school uniform) first met True Father in March 1956, having just turned thirteen. Mother entered middle school that April. In raising the young Hak Ja Han, Grandmother Hong tried to have her grow up pure and untainted by the world. True Mother attended an elementary school in Daegu, and she grew more beautiful each day. She was also a good student, so she was popular. Grandmother Hong was uncomfortable with the fact that True Mother was always the center of attention, because she had received many signs in addition to the revelation, "This child is the daughter of the Lord." Not long after they had come to South Korea, a stranger who saw True Mother gave an astonishing testimony, saying in effect, "She is a sacred person of heaven and earth. She has come to do two great things. However, she needs to succeed in the righteous way; otherwise, when she goes out into the world she will become a traitor." Surprised by what the man said, Grandmother Hong exclaimed, "How can you say such a thing?" He answered, "This is the destiny she was born with when she came into the world." Then he asked, "Do you believe in Jesus?" When she answered yes, he said that was good. After hearing what he said, I was determined to succeed on the righteous path, no matter what. That was why I went to Jeju Island after coming to South Korea, and why when I joined the Unification Church, I thought that I would put her through middle school no matter what it takes and then fortify her with the Divine Principle and make her into one of the best Unification Church members. Not once did I even dream that she would become the True Mother. Thus, to raise True Mother to be even more chaste and pure, Grandmother Hong moved to Seoguipo on Jeju Island in 1954. She was of the mind that True Mother should be raised as an ascetic after she graduated from elementary school. It was her mother's determination to create an environment in which True Mother could grow up thinking of nothing else but God, unshaken by any temptation, until she met the Lord at his Second Coming. Therefore, they went to Jeju Island, and at an age when she might otherwise have been playing and running around with her friends, True Mother began her spiritual training, which was so severe that even Heaven took pity on her. At the time, True Mother transferred to the fifth grade class of Shinhyo Elementary School in Seoguipo, which is Hyodon Elementary School today. Soon-ac Hong continued with her practice of eating raw food, eating nothing but pressed barley soaked in water with radish kimchi, but she made steamed millet for True Mother. Even though that was the life they led, she also donated school uniforms and shirts to her more needy neighbors. Grandmother Won Mo Cho had been living in comfort with her son and daughter-in-law, but she wanted to come and live with her daughter Soon Ae on Jeju Island. So finally they brought her to Jeju Island, and the three of them, True Mother, her mother and grandmother, were reunited once again. In those days, Soon Ae Hong had grown thinner due to her long practice of eating raw food. The Bong-eui Elementary School in Chuncheon as it looked in the 1950s when True Mother was a student there (1955). 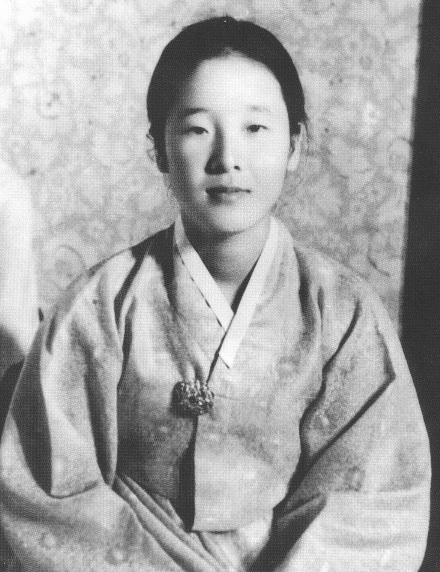 Her mother, Soon Ae Hong (later given the title Dae Mo nim) met and joined the Unification Church during her final weeks here. Soon Ae Hong's younger brother Soon Jeong Hong grew deeply concerned about his lonely mother, sister and niece living all by themselves on Jeju Island. At the time, his military posting was to Chuncheon in Gangwon Province, so he wrote to them, twice, inviting them to come to live with him. At first, his sister refused, but then she got the feeling that his invitation was in some way Heaven's will, so they moved to Chuncheon. After living in such a way for nine months, I received a letter from my younger brother asking me to return to the mainland with our mother. At first, I did not go. Then he sent another letter, asking me to bring our mother to the mainland at once. Left no choice, I then thought to myself, 'There must be a reason that we need to return to the mainland'. When I think about it now, I believe I did well to leave Jeju Island. If we had not left then, we might have continued to live there for good. So, when all is said and done, my brother saved me. I went to Chuncheon. At the time, my brother was working as the head of a distribution agency. In Chuncheon, I began my business again. 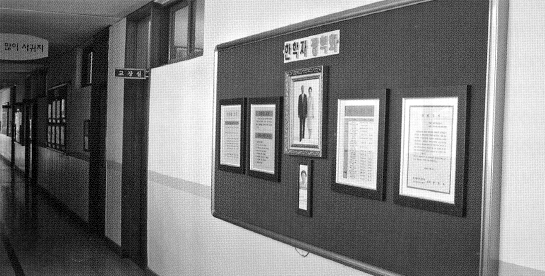 A memorial to True Mother haying been a student there hangs on the wall of Bong-eui Elementary School in Chuncheon. 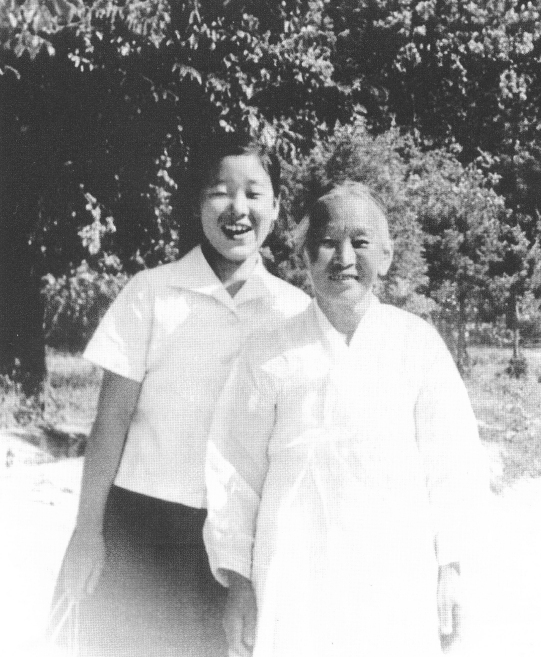 In February 1955, True Mother transferred to Bongeui Elementary School in the same district in Chuncheon and soon after moved up to sixth grade. On March 2, 1956, she graduated. In True Mother's school record, it is written, "She is virtuous and kind, somewhat refined in manner, and the most feminine among all her classmates." It also states that she graduated with honors.